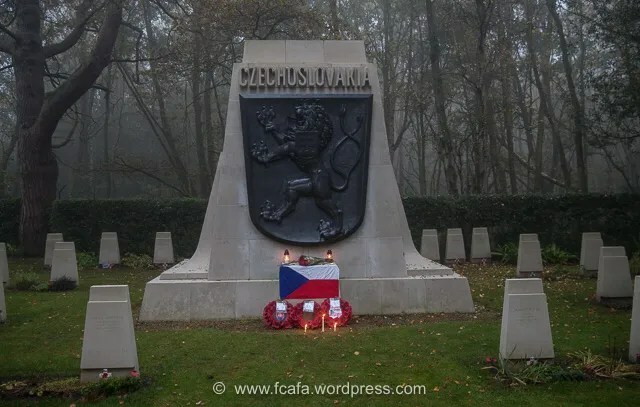 The annual gathering to commemorate the founding of Czechoslovak, on 28 October 1918, was held, by the Czechoslovak Memorial, at Brookwood Military cemetery on 1 November 2015. The ceremony was well attended with HE Ĺubomír Rehák, Ambassador of the Slovak Republic, Antonín Hradilek Acting Head of the Embassy of the Czech Republic, Brigadier General Jaromír Šebesta from Air Force of the Czech Republic, Col. Jiri Svatos, Defence Attache of The Czech Embassy, London and Col. Milan Gavlas Defence Attache of the Slovak Embassy, London providing representation for the Czech and Slovak Republics. Also attending were three Czechoslovak WW2 veterans, widows and numerous relatives of WW2 veterans and well wishers. Following a welcoming introduction, the opening speech was made by HE Ĺubomír Rehák, in his first visit to Brookwood since his recent appointment to London as Ambassador. His speech, in English, reminded all attendees of the bravery and sacrifices of the Czechoslovak airmen and soldiers who had served in Great Britain during WW2 with Antonín Hradilek speech was on a similar theme. Concluding speech was by Brigadier General Jaromír Šebesta who highlighted the role that Czechoslovak airmen had contributed, while serving in the RAF, to the Allied war effort. The Czech, Slovak and British National anthems were then played followed by wreaths being laid by attending officials and well wishers. A nice addition to the ceremony was when young children amongst the attendees were invited to lay large poppies by each of the 46 Czechoslovak headstones which are adjacent to the Memorial. This year, an additional ceremony was held to dedicate the newly renovated headstone marking the communal grave where the civilian passengers of the tragic Liberator crash, of 5 October 1945, are interred. Congratulations to Vladimír Anděl and Mike Hermann in their initiative in instigating this refurbishment of the original headstone. 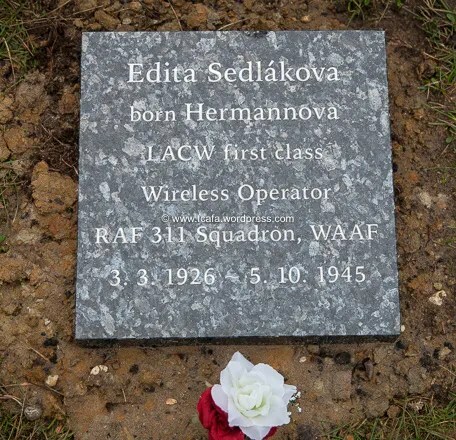 The new Memorial plaque, located in front of the headstone, for Edita Sedláková, who had been aboard that ill-fated Liberator was also dedicated. She was the only Czechoslovak WAAF to be killed in RAF Service. Mike Hermann, nephew of Edita, in his speech gave a short biography of Edita and concluded by thanking various people who had helped to achieve this belated recognition for her. 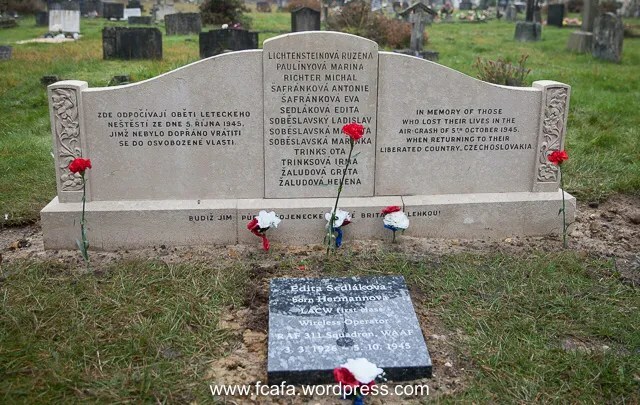 The post-WW2 Czechoslovak plot was colourful this year as apart from Vladimír Anděl usual sterling voluntary work of laying red carnations by each headstone, miniature flags of the Czech Republic and Slovak Republic had also been placed by the headstone as well as numerous red, white and blue poses. 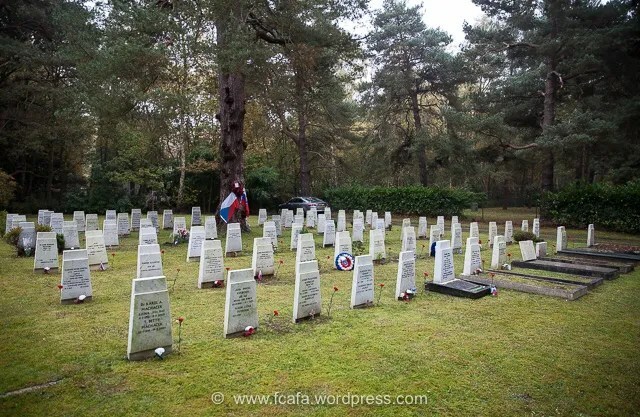 A larger version of the two nations flags were also mounted on the tree central in this plot with further colour provided by Spitfire postcards placed, by an unknown person, against the headstones of fighter pilots. The Czech Embassy again kindly provided Royal British Legion crosses, with Czech flag motif, for attendees to place by headstones of their choice in the post-WW2 plot. This entry was posted in 310 Sqd, 311 Sqd, 312 Sqd, 313 Sqd, 68 Sqd, Ceremony, Events, Memorial. Bookmark the permalink. Thanks for documenting this event so well. I would have loved a little “heads up” on this date to remind me of Brookwood.I am in california and this post arrived 1st Nov. I do hope to take part sometime in the future.